It’s not surprising during this time of year that concerns of algae growth in one’s pond are starting to come up more and more. After a long winter and a spring that seemed to go by as fast as a weekend, there is finally consistent sunshine and warm weather. The dramatic increase in sunshine sparks the perfect conditions that allow algae to grow. Be mindful that a sudden bloom of algae in your pond is not something to be overly concerned about. It’s completely natural and in most cases will clear itself up in a few weeks and the water conditions will return to normal. By following your normal practices of managing the quality of your pond, you will naturally fight and control the algae within it. Taking steps such as repositioning plants or adding new ones, and starting your filters and pumps will all work to restoring your water parameters and algae to normal levels. Other additions such as waterfalls and other effects your pond may have will also enrich the water with more oxygen and further reduce ammonia and nitrates. All of these actions will contribute to controlling and reducing the presence of algae within your pond. However; occasionally there are times when algae persists in spite of everything else. This is usually an indication there is an imbalance in the pond. Some common reasons for persistent algae growth include excess nutrients, too much sunlight, and high phosphate or carbon dioxide levels. The good news is that even though algae growth may be accelerated due to the conditions of your pond, there are some options that you can take advantage of to control the algae. One common tool for combating algae growth is additives. There are a number of liquid or dry granulated algae control products that effectively reduce algae growth without harming any fish. Make sure to be careful when using algaecides as too much of them can kill the algae too fast and deplete the oxygen in your pond. If phosphate levels are high in your pond causing algae growth to accelerate, another additive you can use is a phosphate remover to remove both organic and inorganic phosphates. Another great tool to control algae growth is a UV clarifier or sterilizer. 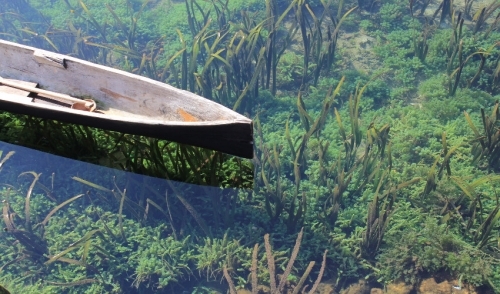 A clarifier is a safe and efficient way of reducing water borne and free-floating algae. Adequate filtration must be present to remove the dying algae and refrain from polluting the water conditions. Other recommendations for reducing algae are more shade, aerations, and even a water change. Algae thrives in sunshine and poorly oxygenated water. By adding shade and introducing a aerator or water feature to the pond, you can control the algae growth. Algae growth is natural and easy to maintain. A pond is an ecosystem and requires some balance to remain healthy. Provide maintenance on your pond regularly and follow some of the tips in this article to control the algae in your pond.